This weekend saw Conor Murphy in action, Conor was competing in the U17 1500m. It was scheduled over the two days, heats on Saturday with the final on Sunday. I had hoped that it would be a straight final as Nenagh is not a great venue and its tough on athletes and parents driving up and down both days. Anyway Conor's race was list for 3pm and we arrived in plenty of time, Conor did his own thing and I watched the sprints as there were a number of Kildare Athletes in action. Conor knew his race plan, he was to stay focused and work hard throughout the race. He went into the call room, the race wasn't going to be a straight final there would be two heats, first 3 from each heat and the 2 fastest would qualify for the final. 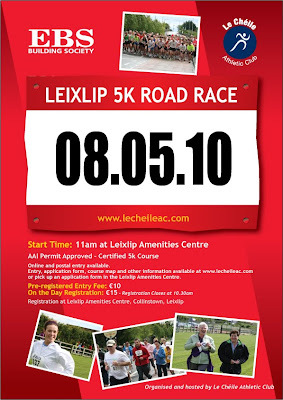 Conor was drawn in the first heat, so was the current Leinster champion. Race started and they were bunched together, with the lead changing a number of times over the first 5 laps, the pace was nice and steady with 36seconds - 37:84 the time over the first 4 laps, lap 5 saw the pace drop to 38:84, lap six saw a quicken of pace and when they turned the bend into the final lap the first 3 athletes stepped up a gear. Conor was in 3rd place but on the shoulder of the guy in second, it was neck and neck coming into the home straight, final lap 32:72, Conor qualified in 3rd place for the final. Job Done and a new PB. We watched the 2nd heat with great interest, one athlete took an early lead and stayed out in front for the 7.5 laps, he finished way ahead of his competitors. All athletes in 2nd heat appeared to be slower than Conor's heat save the winner of the heat, the exact times were not up when we were leaving. Conor was supported on the day by his dad and sister. Unfortunately I was unable to travel down on Sunday to see Conor in the final, but he had lots of support from his mum, dad and sister. I don't know exactly how the race went but the lad who won the 2nd heat (i'll have to look up his name) won the All-Ireland title, followed by the 1,2,3 from Conor's heat, so Conor finished in 4th position, which is the toughest place to finish, but Conor took another 3seconds of his time from the previous day. Conor did say that his quads were on fire on lap 5, he's very happy with his performance and he's looking forward to the track season. Well done and onwards and upwards! Photo to follow! The first round of the League will take place this Saturday 20th March at 2pm in Newbridge AC. 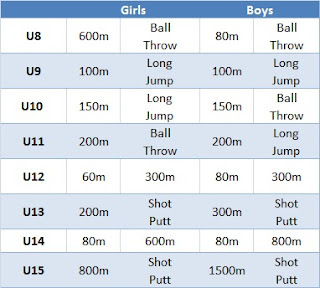 The following are the events for each age category. The league is run over 4 rounds and athletes will have 2 events in each round and they must compete in their own age group. All of out athletes are eligible to enter and we encourage as many as possible to take part. We will be competing in Group B and entry is €5 which covers all 4 rounds of the league. We look forward to seeing as many of our athletes as possible. Congratulations to our own David McCarthy who delivered a season's best in the 800m World Indoor Championships in Doha this morning, with a time of 1:51.88. He finished in 4th place which was not enough for him to qualify, but an amazing achievement for getting to the World Championships and performing as he did. Well done David. Its all happening on the International stage for Le Chéile at the moment!!! We wish David McCarthy the best of luck in the World Indoor Championships in Doha next weekend. David will take part in the 800m and has been selected for the 4X400 relay team. David has delivered some fantastic results over the last few weeks and we expect the improving form to continue. Best of luck David! It was also confirmed by Ultra Running Ireland that John O'Regan has been selected for the Ireland team in the World and European 24 hour Championships, to be held in Brive, France on the 13/14th of May. John was selected based on his debut performance in London last year with an impressive 220km in a 24 hour track race. We wish them both well and will be keeping a close eye on them. There were 3 athletes in action over the weekend. Conor Murphy in action on Saturday and Sunday (thanks to Colm for going down to Nenagh both days). Julie Boyle and Basit Enafie on Sunday. Conor has told me that the best preparation was no preparation, he arrived as the athletes were taking to the line so he didn't have a chance to warm up correctly and didn't have time to think about the race. Conor was competing in the 1500m U17 race and he was 2nd on the day, many congratulations to Conor. Conor had a busy week as he was in action the previous Sunday in the B All-Ireland and had also raced on Wednesday in the Leinster Schools, finishing 27th overall, in a very tough race in terrible conditions. Unfortunately there are no photo's of Conor on the podium. Conor was back down to compete in the 800m on Sunday a bit tired, but he took to the line and with 4 laps of the track to run he finished in 6th place. Basit Enafie was competing in the 60m and 200m U17, unfortunately he just missed out on a place in the finals. Representing the girls was Julie, Julie was running in the 60m and 200m U17and made it to the final in 60m and finish 6th overall. Many thanks to the Conor, Julie Basit and a big thank you to their parents who are always so supportive . 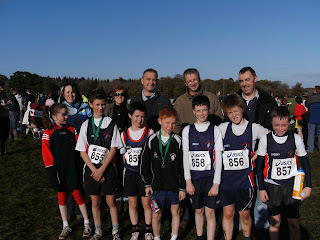 The Le Chéile athletes and supporters at the 2009 Cross Country Leinsters.